The assessment of disease burden using routine marrow histology and flow cytometry is notoriously inaccurate, due in large part to the patchy nature of marrow involvement and issues with sampling . The sFLC assays facilitate disease response assessment in most NSMM patients, and can be done with routine blood testing rather than requiring imaging or bone marrow assessment . 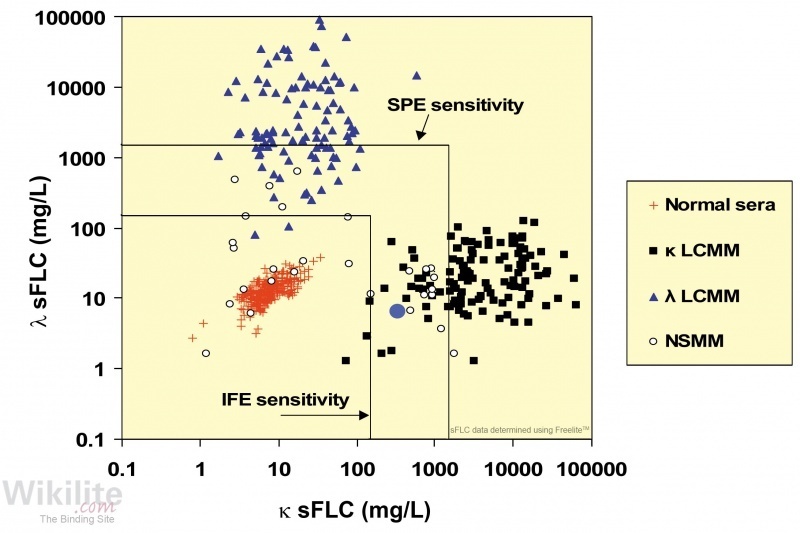 As sFLC concentrations assess FLC production from all of the bone marrow and extramedullary sites, they are likely to provide a better indication of overall tumour activity than bone marrow aspirations or skeletal surveys. The use of sFLC analysis for monitoring oligosecretory patients including those previously classified as NSMM, is now recommended in international guidelines (Chapter 25). In the first study of sFLCs in NSMM patients, limited monitoring samples were available from six patients, and revealed elevated sFLC levels at clinical presentation, reduced concentrations during plateau phase, and increased levels at relapse (Figure 16.4) . One patient (no. 2) showed some discordance between the clinical assessment and sFLC concentrations; whilst still being classified as being in remission, rising concentrations of sFLCs indicated imminent disease relapse. Historically, randomised trials have generally tended to exclude patients with NSMM because they do not have easily measurable disease . However, since the incorporation of sFLC analysis into the International Uniform Response Criteria (IURC) (Section 25.3.5), the majority of NSMM patients can now be enrolled into clinical trials. For example, in the study of 28 NSMM patients described above, 17/28 (61%) patients had measurable monoclonal sFLC concentrations (defined as iFLCs ≥100 mg/L, provided that the sFLC ratio is abnormal) . Similar findings were reported by Migkou et al. . Many patients with NSMM have been studied prospectively since sFLC analysis has been routinely available . Two examples are described in the clinical case histories below. NSMM with “difficult to assess” symptoms during clinical relapse. A 38-year-old woman presented with a fractured rib following mild trauma. Over the following months, the pain subsided but non-specific symptoms including breathlessness, vague chest pains and tiredness persisted. During this time, full blood counts, erythrocyte sedimentation rate (ESR) and biochemistry were all normal, as were chest X-rays and lung function tests. In the absence of a diagnosis, the general practitioner considered a psychiatric assessment. Seven months after the initial presentation, she remained symptomatic and was re-investigated, whereupon bone scans and X-rays showed extensive osseous lesions. Immunoglobulin measurements showed immunoparesis, but no serum monoclonal protein was detected. She was noted to have hypercalcaemia (2.85 mmol/L - NR: 2.08 - 2.67) but had normal renal function. In view of the absence of monoclonal immunoglobulins, MM was still considered unlikely. However, a skull X-ray and CT scan showed osteolytic lesions (Figure 16.5) so a skull biopsy was performed which was reported as ‘plasmacytoma/NSMM’. She was given chemotherapy for the following 8 months that resulted in clinical remission. Seven months later, and over 2 years after the initial presentation, she re-attended hospital because of chest pains and breathlessness. Again, clinical examination was normal, as were routine biochemistry and haematology tests. Immunology tests showed reduced immunoglobulins but no detectable monoclonal protein by serum electrophoresis. A bone marrow biopsy showed 5% plasma cells that were morphologically normal. Chest X-ray, a ventilation perfusion scan and lung function tests revealed no evidence of pulmonary disease. Blood tests were requested for sFLCs, the results of which were: κ 330 mg/L, λ 6.5 mg/L and an abnormal κ/λ ratio of 51 (Figures 16.1 and 16.6 [week 67]). Doubt was expressed regarding the validity of the results so sFLC measurements were repeated 2 and 3 weeks later and showed κ increases to 470 mg/L and then 525 mg/L with a rising κ/λ ratio, confirming disease recurrence. sFLC concentrations were assessed retrospectively from archived samples and then the patient was monitored prospectively. Figure 16.6 shows that the κ sFLC concentrations had increased rapidly during the tumour recurrence, with an apparent doubling time of 30 days as indicated by the κ/λ ratio. 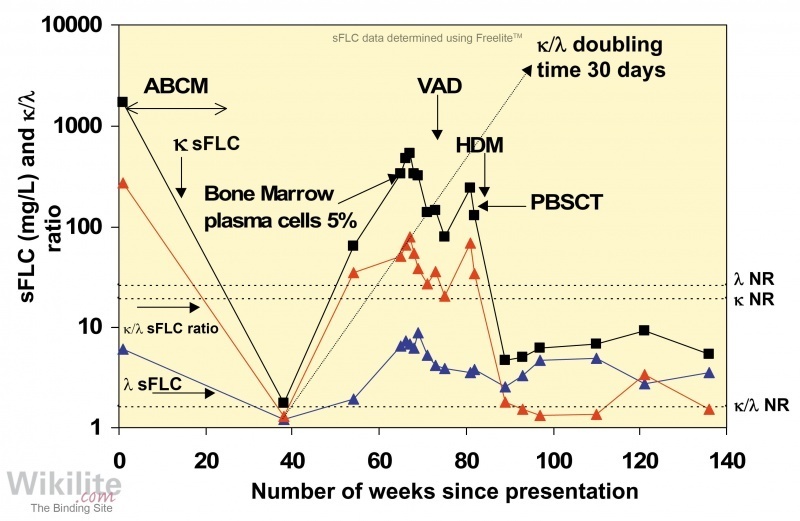 κ sFLC concentrations subsequently reduced during treatment. 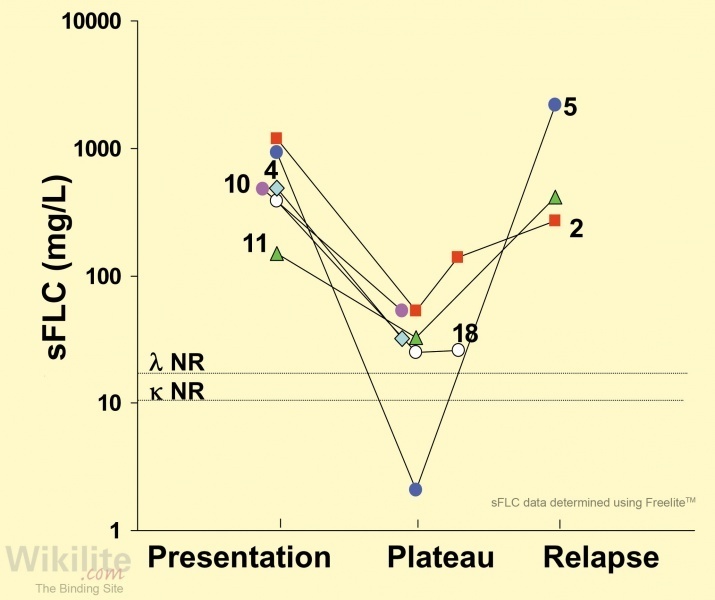 During the period of relapse, the λ sFLC concentration increased suggesting reduced renal clearance of FLCs from impaired glomerular filtration (Section 6.3). After a peripheral blood stem cell transplant (PBSCT) κ and λ sFLC concentrations and the κ/λ sFLC ratio returned towards normal as the patient went into clinical remission. A patient with NSMM/plasmacytoma who was excluded from clinical trials. A 37-year-old man with pelvic pain was found to have a solitary plasmacytoma located in the right iliac crest. Bone marrow biopsy of the opposite iliac crest was normal and no monoclonal protein was identified in serum or urine. Treatment comprised surgical resection followed by irradiation (5,000 Gy). Subsequently, he remained asymptomatic, but 5 years later a routine skeletal survey showed a thoracic spine lesion at T2, which was irradiated. Over the following 7 years further painful lesions developed. These were identified using different scanning techniques (particularly positron emission tomography) and were treated with irradiation or melphalan and prednisolone. Throughout this period, and in spite of repeated testing, no monoclonal protein was identified by SPE and UPE. Finally, 12 years after the initial presentation, sFLC immunoassays became available and showed κ 7.5 mg/L, λ 632 mg/L and a κ/λ ratio of 0.01. These results identified a λ-producing tumour with no associated suppression of the κ sFLCs (Figure 16.7). 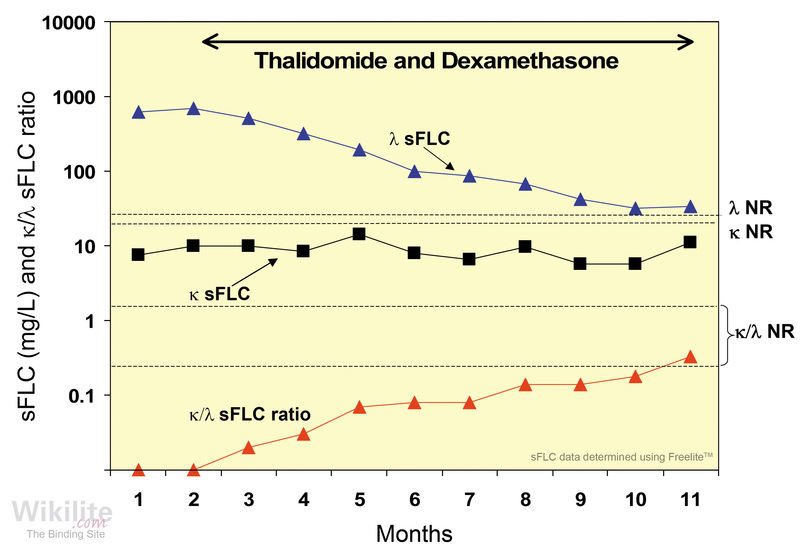 One month later, λ sFLC concentrations had increased to 700 mg/L, prompting treatment with thalidomide (50 mg/day) and dexamethasone (40 mg/week). Over the subsequent 7 months, the λ sFLC concentration gradually fell to 33 mg/L and the κ/λ sFLC ratio began to normalise. Based on the sFLC results, dexamethasone was reduced to 12 mg/week and he remained well and in complete remission. Figure 16.7 shows the changes in sFLC concentrations over a 12-month period. The effectiveness of the drugs and the doses required can all be monitored during this period of therapy. This has produced clear benefits for the patient and avoided costly scans and painful bone marrow biopsies. Furthermore, since the patient has measureable monoclonal sFLCs (>100 mg/L ) he can be entered into clinical trials of new treatments. The patient has been monitored successfully using sFLC assays for many years since the original tests were performed. What proportion of patients classified as non-secretory, have abnormal sFLC ratios? Do international guidelines recommend sFLC analysis for NSMM patients? In the largest study to date, 68% had abnormal κ/λ sFLC ratios. Other smaller studies suggest that it could be higher. Yes, sFLC analysis is recommended by international guidelines for the diagnosis and monitoring of NSMM (Chapter 25).